May his memory be blessed and may he find the peace he was denied in this life. May he know that he left this world a better place for having been here and shown us the definition of courage and standing true. May he rest in peace. I didn’t know about him before, but if he brought the Soviet Jewry cause to national U.S. attention, then big kudos to him. 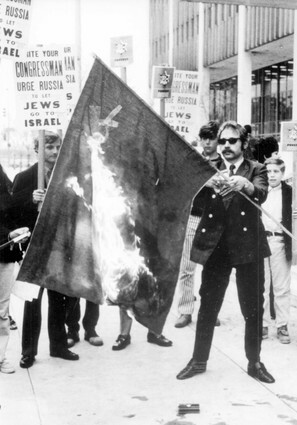 Double points for burning the USSR flag WITH sunglasses on. I was a friend of Si’s and knew him well. He was a hero to all who knew him. Si knew how to do what it took to get the need for helping Soviet Jews (and Christian Pentacostals also)known. He was a great thinker of ways to accomplish this. He wasn’t above driving the Soviet officials crazy at the same time. May he rest in peace. He was a great man. Wow. What a great Jew. He tried to engage the local Jewish Federation Council to take an activist role in the name of Soviet Jewry but was met with resounding silence. He was told not to rock the boat as the U.S. was trying to achieve a level of rapprochement with the Soviet Union. … hey middle, that paragraph is all you need to know about Obama and Bibi… and American Jews. Well, burning flags always helps, I guess. Like, say, burning US flags really helped those poor Iraqis. And burning Israeli flags (again and again and AGAIN ad nauseum for the past 60 years) has done wonders in alleviating the misery of the Palestinians. Tehei Nishmato Tzrurah b’Tzror haChayim,v’Zichrono liBracha.